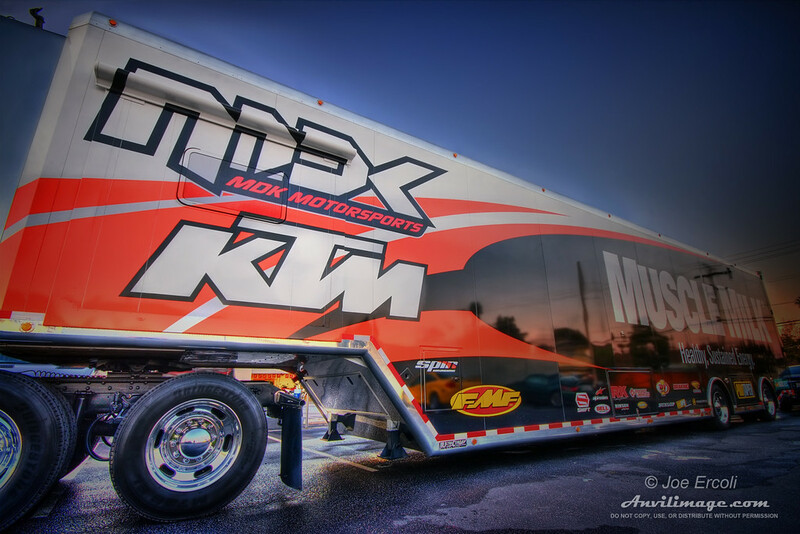 Supercross Roadshow, original photography by Joe Ercoli. Once again the AMA Supercross is coming to San Francisco’s AT&T Park and the Muscle Milk MDK/KTM race team stopped by the shop for a meet-n-greet appearance. Ever since I was a little kid I was always amazed by the size and versatility of semi trucks and all of the different configurations that you could put together. When this beast pulled up into our parking lot, I knew I was going to have to grab a pic or 10! Too bad it wasn’t open for exploring because the trailer is like a pop out RV with different rooms for the bikes, mechanics and a lounge. This entry was posted on Saturday, January 31st, 2009 at 12:47 am	and is filed under Blog, Photos. You can follow any responses to this entry through the RSS 2.0 feed.